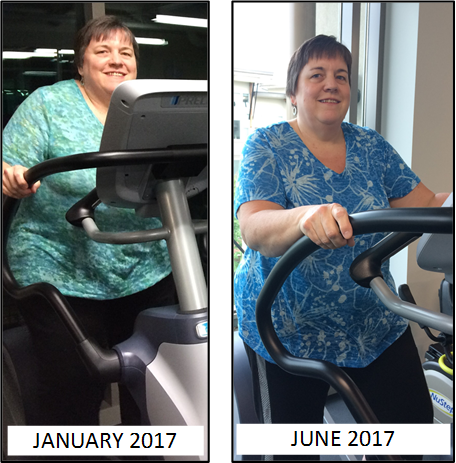 June 2017 Member of the Month – Leanne T.
We are pleased to announce Leanne as our member of the month for June. Leanne has shared her journey and shows us how only a few months of lifestyle changes can impact your life! I had been struggling with exercise for the last few years because both my knees are in bad shape. I was in pain all the time and more and more was becoming unable to stand for long periods of time or walk much of a distance. I was interested when I heard about LIVE WELL Exercise Clinic and that one was opening up in Abbotsford. I knew I needed to exercise and that the people at LIVE WELL would be able to medically assist me with exercises that would benefit my health and that I would be able to do. I committed to a one-year membership and I can’t believe I have already finished one quarter of it! My Mother had a stroke at age 65, and I want to do everything I can so that doesn’t happen to me. I have now finished four months at LIVE WELL, exercising three times per week, and have always happily gone even if it’s been a crazy day at work. That is an amazing thing for me but I think it has to do with the community we have at LIVE WELL, and the awesome staff. When I first tried the elliptical trainer, I thought I was going to pass out after 5 minutes but then I got up to 10 and then 13 and eventually 15 minutes! It is possible – we just need to make ourselves persevere because it does get easier. It’s still a workout for me to do 15 minutes but I am stronger for sure. I haven’t had any Coca-Cola since the beginning of January which was huge for me. I have lost a bit of weight and some inches but that was not my focus at first. It was just to be committed to LIVE WELL and now I’m learning more from the weekly emails and how to eat properly and healthier. As a result of these last 4 months, I am feeling much better and have more energy to carry me through my day. I am stronger and don’t feel like I might pass out when I bend over to tie my shoes! :) I hope to continue what I have been doing, but now to concentrate on my eating habits. I’m starting by keeping an honest food journal for one month that will help me be able to see some areas that need changing. I would encourage anyone to consider joining LIVE WELL where they will do an assessment of you and set up a program specifically designed for you and that you are capable of doing. You just need to start! Take small steps and then those steps will grow each day. That’s what I will continue to be doing as I journey to a healthier me!